Welcome to OMEGA ZONE. Shoot baddies, avoid lasers. Collect coins to access the bonus round. The shield gives you a moment safety from enemy fire and allows you to phase through the rotating lasers. Extra lives at 5000 and 12000 points. Nice omega race remake ! 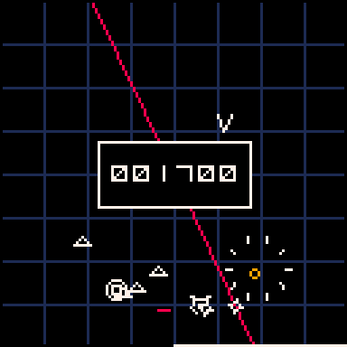 It's played as the game Asteroids, and it's the first time, I listen sound with echo in Pico-8.